Page one of the simple, beginner's pattern to make a My Little Pony plushie. What fabric do I use? Fleece? Tnx for the pattern and the great tutorial. i need to print this out on A4 paper right ? Thanks for this! I finally made some OCs worthy of a plush and I needed something simple to make them with. So thanks! Do you have a tutorial for pegasi? Yay!! I can't wait to make my own little ponies <3 It's awesome of you to put this out there for our use! when I print the pattern out it is small can you tell me how I can make it bigger ? It should print out to fit A3 sized paper at 100 dpi - if it's coming out too small, you might need to check your printer settings. I suggest using Wash A Way for tacking. It'll dissolve when you wash it. Be careful, though; it's very delicate. I don't recommend washing plushes, though. What size paper would you suggest using for printing on? Would the standard 8.5x11" work? Yep, I scaled it for A3 paper. Using this too make a Derpy, Can't wait to see the way she turns out! Um.... I really dont understand what the letters mean? I think the letters are where you connect them, like on the back of the head it says A1 and on the front it also says A1 so I'm guessing that's where the meet. MONEY? DOES IT COST MONEY OR NO? Fleece is inexpensive, easy to find in stores and pretty forgiving. Just be sure to get fabric that doesn't fray, for best results. 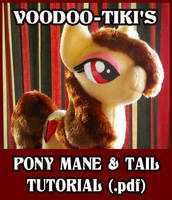 I just downloaded your pattern on making MLP plusies and I gave it a shot on making my own. In the end my ponies that I did of the doctor, derpy, and OC came out great. You can check them out on my gallery and see what you think. how do I sew on the wings? there is nothing about them in the tutorial. Aaand Nevermind the last comment of mine. Sorry. Using this pattern for my first plush!